Missy, a purebred Golden Retriever rescued from a large-scale breeding operation, had been in her forever home for only a week when she spooked at the sound of door hitting an aluminum can and bolted through an open door. Missy’s family lived in the Northwoods of Minnesota, where bears, wolves and other large predators are commonly seen. Fearing daily for her safety, her family mounted an aggressive search, quickly spreading the word of their missing dog through neighbors, local businesses, mail carriers and DNR conservation offices. They also set out feeding stations and trail cams, hoping to catch sight of her. Their swift awareness efforts paid off, and Missy sightings began to roll in. She was spotted as far as 14 miles away before she started making her way back toward the family’s home. Following a tip, the family set a feeding station, trail cam and small live trap where she had been sighted, and she returned several nights in a row. But Missy refused to fully enter the conventional live crate, instead managing to steal the bait without being trapped inside. In one photo, she actually has her paw on top of the trap, as if taunting everyone’s efforts to catch her! Several RAGOM volunteers had been discussing the need for a larger trap, particularly for cases like this one. So overnight, RAGOM volunteer and Retrievers founding member Greg James built a trap based on a design he’d already had in mind. Other volunteers transported it from the Twin Cities to the Northwoods within a day. The first night it was put out, Missy entered the trap and triggered the gate. She waited calmly until her family came to get her. 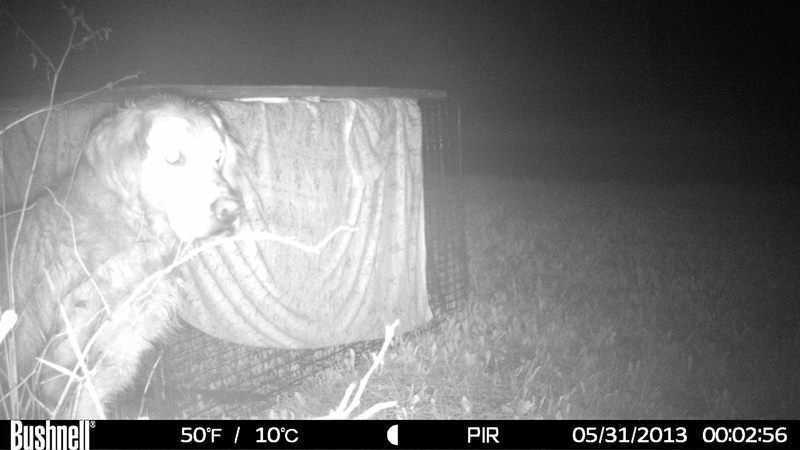 From that night on, our large live trap has been known as the Missy Trap.